The early signs of liver disease are nonspecific. They include loss of appetite, weight loss, and chronic intermittent vomiting and diarrhoea. Vomiting is more common than diarrhoea. Drinking and urinating more often than normal may be the first signs, and the principal reason for seeking medical attention. In the early stages of liver disease the liver swells and enlarges. As the disease progresses, the liver cells die and are replaced by scar tissue. The liver then becomes rubbery and firm. This condition is called cirrhosis. It is not reversible. Before the liver reaches this terminal stage, it can recover from damage and heal itself to the point where your dog has normal liver function. This is possible if proper treatment is instituted early on; the extent of recovery depends on the exact cause of the liver damage. Eighty percent of liver cells must die before the liver begins to fail. The signs of liver failure are jaundice, hepatic encephalopathy,ascites, spontaneous bleeding, and dependent edeoma-swollen lower limbs. Treatment of liver failure is directed toward treating the liver disease that is causing it. Hospitalization is vital for treating acute liver failure. Fluids and electrolytes, along with colloid (the gelatinous substance necessary for proper thyroid functioning) replacements and oxygen supplementation, are key aspects of treatment and care. 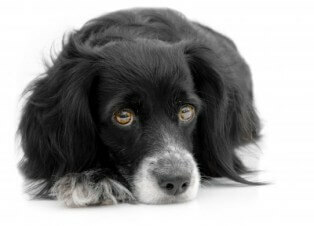 Your dog will be placed on restricted activity in order to give the liver an opportunity to regenerate. Catheter feeding is recommended for highly unstable patients, while enteric feeding (feeding directly into the intestines) in small amounts is recommended for otherwise stable patients. A normal protein diet with supplemental vitamins E and K is advised. The common medications used for liver failure are antiemetics, drugs for hepatic encephalopathy (brain disease, with or without edema), hepatoprotectants (to decrease the activity of aminotransferases), coagulopathy drugs, and antioxidants. Vaccinating dogs against the infectious canine hepatitis virus (an acute liver infection), and avoiding the use of drugs that have potentially harmful hepatotoxins as ingredients can act as preventives against acute liver failure.